In the late 1700’s and throughout the 1800’s, much of America’s vital records were kept in Family Bibles. Family Bibles are often a treasure trove of vital information not otherwise available anywhere else. They were passed down from generation to generation and are usually in the possession of family members. Those no longer in the possession of the family may be at a historical or genealogical society. They are sometimes transcribed and published in genealogical periodicals and some can also be found online on the Internet. Relatives often gave a Bible to a bride as a wedding gift, where she recorded information about her immediate family and close relatives. Relationships were seldom stated but were often implied. Names of parents, children, and their spouses, including maiden names, were frequently given along with dates of birth, marriage, and death. Sometimes the age of a person was given at the time of death. Even if you don’t know of a Family Bible, or have only heard rumors of the existence of one, it’s worth a little detective work to see if you can locate one. Often, they have been passed down through maternal lines and now reside with someone who doesn’t even know how they are connected to the people listed in the Bible. 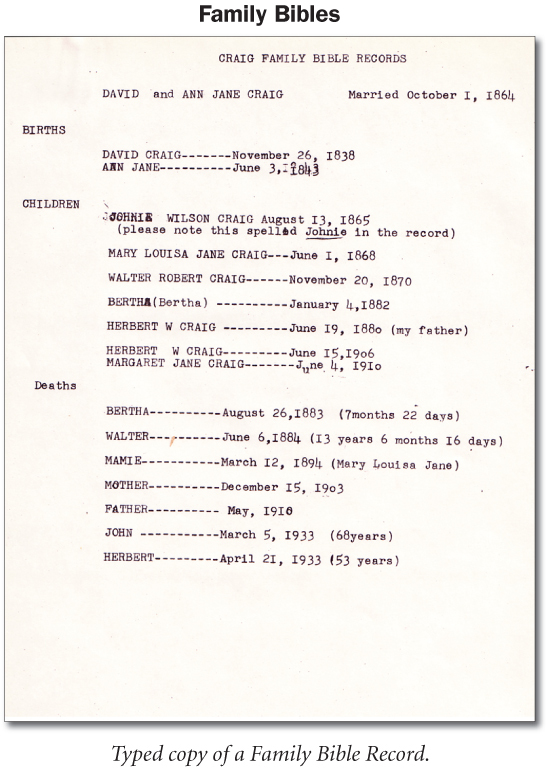 TIP: Many Family Bibles have been transcribed and published in one of the thousands of genealogical periodicals that have been published over the years. Use the PERSI Index to find otherwise unfindable Bible records—it’s a keyword index to the titles in the Allen County Public Library’s holdings of over 6,000 genealogical periodicals. 1) In the homes of your known relatives. 2) In the possession of distant cousins located through your diligent research. 3) Family History Library — check the FHL Catalog under [State], [County], [Town] – Bible Records. Try searching different locality sites for any transcribed Bible records they may have posted. 5) PERSI Index—this is the Periodical Source Index available at HeritageQuest and at our Family History Center.